The tea bag infusers are actually little hand crafted fabric pyramids with a tiny leaf tag handle. You just sit them in your cup with hot water and let them steep. But, don't put them in the microwave-- there's wire in the little handle. Tea Forte offers infusers for hot tea, iced tea, and cocktails. Lemon Grass Mint Mojitos-- can you imagine? Yuhhh-um! 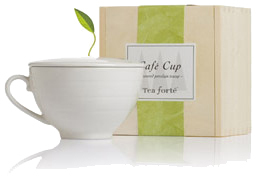 You can also purchase custom teaware with a little hole in the top specially designed for the little pyramids. Soooo cute! 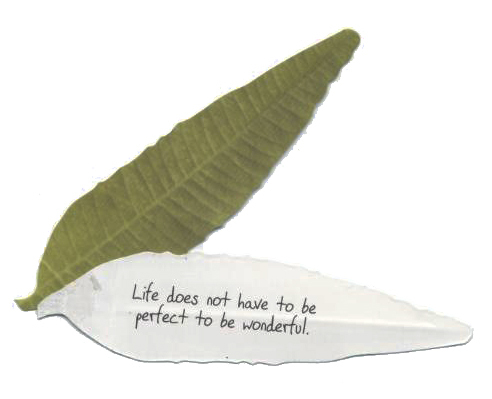 Anyhoo, each of the infuser packages had a little leaf tucked into it with a warm fuzzy message on it. So, in the tradition of The Good Chocolate, I thought I'd share them with you. Enjoy!